Wild Boar hunting in Turkey is one of the most enjoyable and preferable hunting opportunity now a days in our country not just because of the huge quantity of animals but also with big tasked and big weighed animals up to 300kilograms and up to 30centimeters of tasks. Driven Hunts ; We organize this hunt for groups of 8-12 hunters and with a team of 20-30 drivers and 10-15 dogs. The typical types of areas for driven hunts are mountainous areas which are covered with pine and oak trees.We make 3-4 drives a day depending to the weather conditions. We recommend minimum 3 maximum 5 days-driven hunt for successful results.The season starts on September 1st and ends on February 22nd.Also its possible to organize stalking hunt in the night during the driven hunt.The best months for driven hunt are October,November,January and February. Awaiting & Stalking Hunt by Moonlight; The hunters who are looking for a tuskers or a big trophies, stalking hunt in moonlight is the best way. This is one of the most enjoyable types of hunting,its not just sportively but also like a play against sandglass. It's like a game of 'chess' between you and the boar.Sometimes you wait on a rock 30min.-1 hour near the bate or sometimes you stalk around 1-2 kms. for not to make noise but finally you get a huge wild boar with 24-30cms or you miss the same one.It's possible to hunt all year around The best period from March to November. For succesful results 5-nights hunt is recomendable. 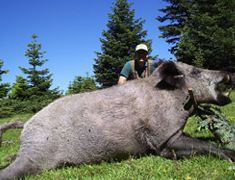 We know what we are doing and we know what the hunters want.Come with us for big wild boars!